Harrison Hot Springs – The Village of Harrison Hot Springs Boat Launch is now open for the season. The public boat launch is operated and managed by the FVRD. Purchase passes directly from the gatehouse. Amenities include marine sanitation centre, washrooms, large parking lot and a staffed gatehouse. Fees in effect during Boat Launch Office hours. 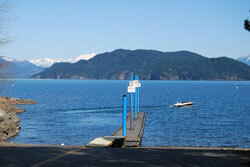 Be the first to comment on "Harrison Hot Springs Boat Launch Now Open For The Season"